NB. This is not a final document but a first draft for public consultation. The public consultation on the first draft of the Strategic Research and Innovation Agenda for Deep Geothermal has been launched. 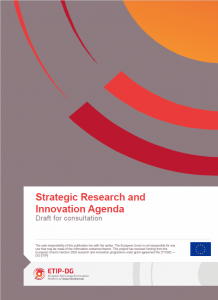 The Strategic Research and Innovation Agenda identifies future research needs and priorities for the deep geothermal sector and it will lay the basis for upcoming calls of European and National programmes as the next Horizon Europe programme. The contribution of the geothermal sector is therefore essential. The complete document (pdf) is publicly available below, while working documents (word with track changes) for inputs are available to ETIP-DG members in the members area under the Bulletin Boards. Please use the working documents, with track changes activated, to provide your inputs: comments and additions for chapters A to F, and proposals for the next generation of technologies (chapter G) . We invite inputs on the draft until the 21/11/2018 COB. Please send your inputs, in track changes, to info@etip-dg.eu. There will be an opportunity to discuss the Strategic Research Agenda during an online webinar that will be organised early December 2018. We wish to sincerely thank the Steering Committee, the Working Group leaders and the members of the ETIP-DG Working Groups for their work and contribution to the document.